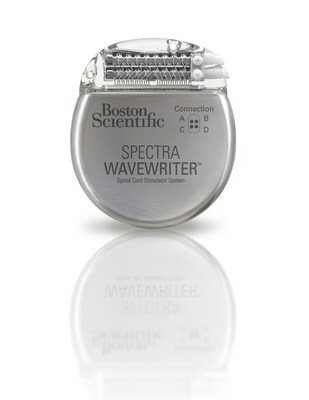 PARIS, Jan. 31, 2019 /PRNewswire/ -- Boston Scientific Corporation (NYSE: BSX) today announced the launch of the Spectra WaveWriter™ Spinal Cord Stimulator (SCS) System in Europe. The Spectra WaveWriter SCS System is the first and only system for the treatment of chronic pain to be able to simultaneously combine paresthesia-based and sub-perception therapy. The new system with these therapeutic options is designed to allow physicians and patients to customise therapy and capture real-time feedback to treat chronic and debilitating pain successfully. SCS works by sending electrical impulses to the spinal cord and masking the pain messages travelling to the brain. These electrical impulses can vary in frequency, pulse width and amplitude and provide pain relief with a light tingling sensation known as paresthesia-based therapy or with sub-perception therapy that works without sensation. "Pain is very personal, and everyone experiences it differently. Pain also changes over time, which for chronic pain patients means that their bodies may become accustomed to treatment and its effectiveness declines," said Dr Vivek Mehta, Consultant in Pain Medicine and Honorary Senior Lecturer, Queen Mary University, London and Director, Pain & Anaesthesia Research Centre, Barts Health, London. "The Spectra WaveWriter SCS System allows us to combine multiple treatment options in one single device, intended to give patients truly personalised therapy that evolves just as their pain does to provide lasting relief." The Spectra WaveWriter SCS System was developed with more than a decade of clinical research focused on optimising sub-perception and delivering multiple therapies intended for more effective, long-term pain relief. These studies include the WHISPER study and the PROCO study*. In addition, the first clinical multi-centre, observational real-world data with over 200 patients using the Spectra WaveWriter SCS System demonstrated significant improvement in overall pain, with almost 90 percent of patients reporting more than a 50 percent improvement in their paini. "We understand the complex challenges people living with chronic pain face daily. Often these people have lived with agonising and unbearable pain for years, having tried numerous treatments that simply do not work," said Vincent Sourdaine, vice president, Neuromodulation, Boston Scientific EMEA. "We are committed to research and development of treatment options for the millions of people who are severely affected by chronic pain and are very pleased to be introducing this new system to help patients manage this." Chronic pain is a widespread problem with 1 in 5 adults in Europe – or 100 million people – affected.ii SCS is a non-opioid alternative for treating pain; the use of medications such as opioids has increased sharply in recent years in Europeiii, with around 1.3 million high-risk users of opioid drugs according to a recent reportiv. *The PROCO study was a multi-centre, prospective, double-blind, randomized study in which patients acted as their own control. This study established in de novo patients that similar pain relief and improvement in quality of life measures are achieved independent of the type of frequency (from 1 kHz up to 10 kHz) used in sub-perception SCS therapy when the proper target and dose are identified. The WHISPER study is a multi-centre, prospective, cross-over, randomized, and controlled study which evaluated the long-term safety and effectiveness of sub-perception SCS pain relief therapy. iii Trends in the consumption of opioids for the treatment of severe pain in Europe, 1990-2016. Bosetti et al. https://www.ncbi.nlm.nih.gov/pubmed/30407692 Last accessed: January 2019.